The MC 840 is a large-diaphragm, multipattern FET condenser that operates on phantom power (minimum 11V). It is the successor to Beyerdynamic’s MC 740, another transformerless multipattern FET LDC. It was designed for transparent rather than colored sound. The frequency graphs show a flat response from 50Hz to 2k, with ~3dB presence peak around 10k. The response is surprisingly uniform across the five available patterns (omni, wide cardioid, cardioid, hypercardioid, figure-of-8). A 5-way switch on the mic body controls the pickup pattern. A second switch enables a pad (flat, -10dB, -20dB). 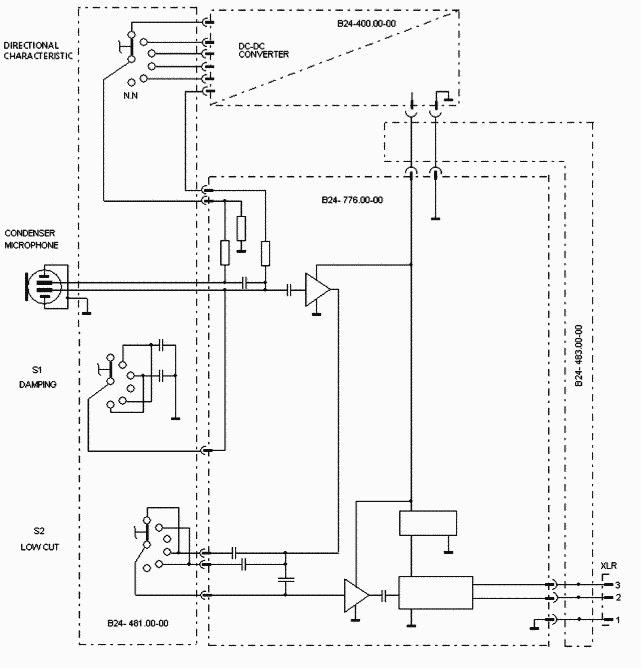 A third switch enables the high-pass filter (flat, -6dB/oct @ 80Hz or 160Hz). Note that the pad and filter switches can be found on the fixed-cardioid MC834. The capsule, although described as “large-diaphragm,” has a ~20mm active diaphragm area (according to SOS). It is a dual-diaphragm design, and supports multiple pickup patterns. The same capsule was used in the multipattern MC740. The headbasket is a 2-layer mesh design. The mic’s circuit diagram (albeit without part numbers) can be found in the Datasheet. The mic ships with an elastic suspension (p/n EA 37), a mic clip (p/n MKV 11), and a hardshell plastic case (p/n ZKK 740-833). As an instrument mic, the MC840 is very capable. Its ostensibly neutral tone combines with the hint of ‘air’ to keep the detail without adding harshness. In a typical project studio it could cope with just about anything, from drum overheads to acoustic guitars, and pianos to percussion. The beyerdynamic MC 840 is also known as: MC840.